The continental margin of East Africa began forming in the PermoCarboniferous with the development of rift basins, and extension occurred intermittently over 150 million years until the Late Jurassic initiation of sea floor spreading. 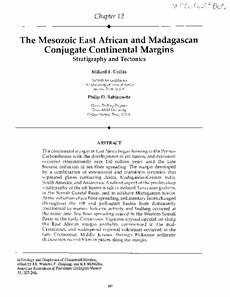 The margin developed by a combination of extensional and transform tectonics that separated plates containing Africa, Madagascar-Greater India, South America, and Antarctica. A salient aspect of the pre-breakup stratigraphy of the rift basins is salt in isolated Tanzanian grabens, in the Somali Coastal Basin, and in offshore Madagascan basins. At the initiation of sea floor spreading, sedimentary facies changed throughout the rift and pull-apart basins from dominantly continental to marine. Volcanic activity and faulting occurred at the same time. Sea floor spreading ceased in the Western Somali Basin in the Early Cretaceous. Vigorous abyssal circulation along the East African margin probably commenced in the midCretaceous, and widespread regional volcanism occurred in the Late Cretaceous. Middle Jurassic through Holocene sediment thicknesses exceed 8 km in places along the margin.